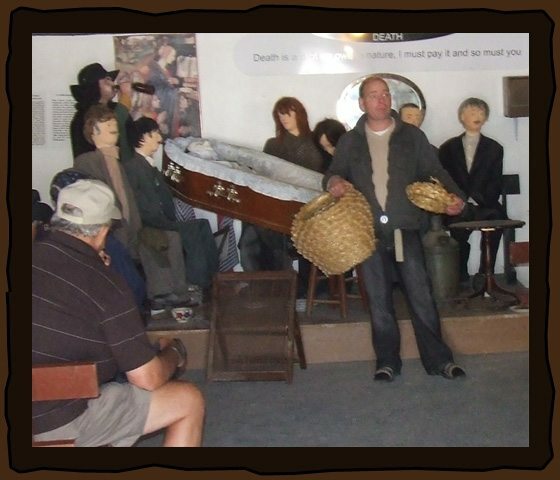 Below is a selection of some of the attractions & exhibits you will find when visiting. The whole attraction is built around and includes original thatched dwellings. 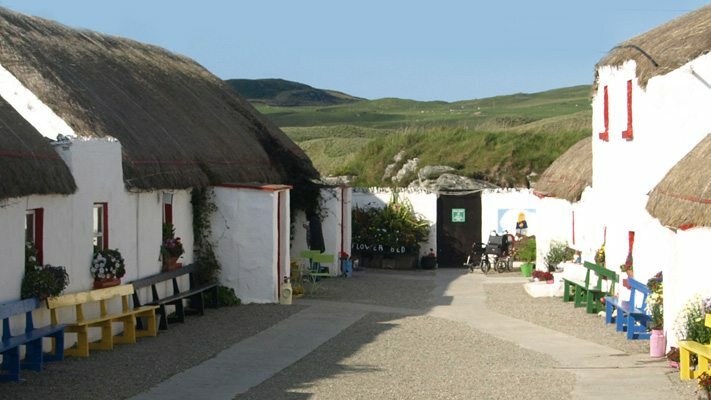 These thatched dwellings were still inhabited up until 1983 by the owners family and one of your tour guides, Pat Doherty. 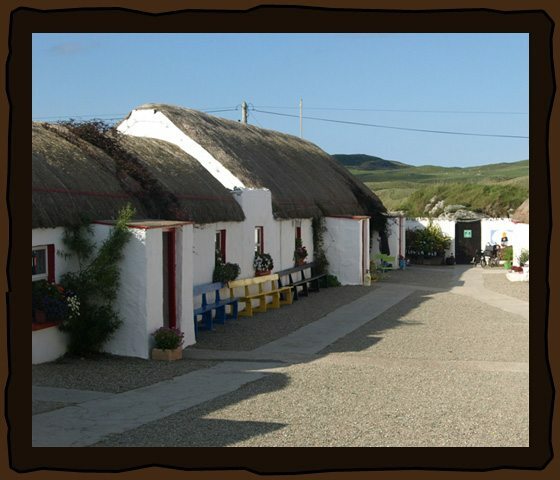 The thatched dwellings are still maintained and re-thatched every year by traditional methods. This traditional send-off for the dead still continues in this northerly part of Donegal. Rather than sending our dead to a funeral home, the remains of our loved ones are kept in the home until it is time for burial. The custom of waking the dead has a rich history. Many of our familiar sayings come from the occasion and many similarities can be found in England, France and other European countries. Evictions were common place in Ireland in the decade after the famine. Landlords cleared their estates to make way for more profitable making enterprises. A quick tour in pictures! All ready & prepared for another day! 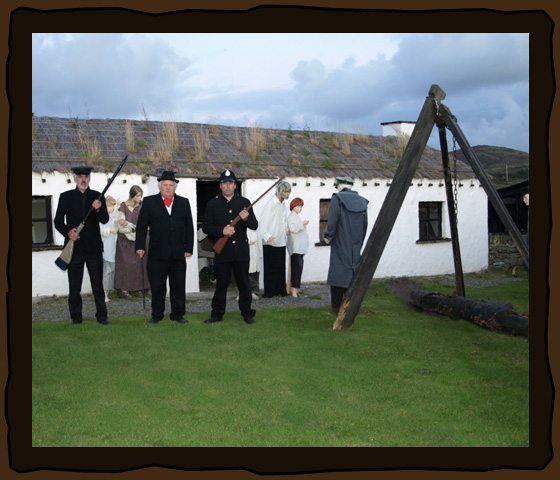 Early morning at Doagh Famine Village before the doors open! 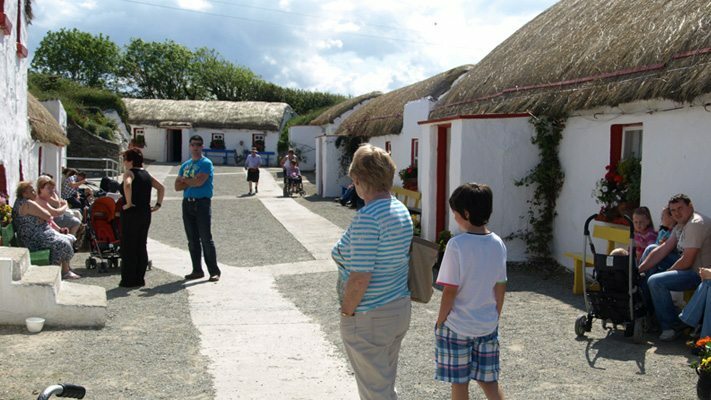 The courtyard, surrounded by original thatched dwellings, is where you enter to start and end the guided tour. 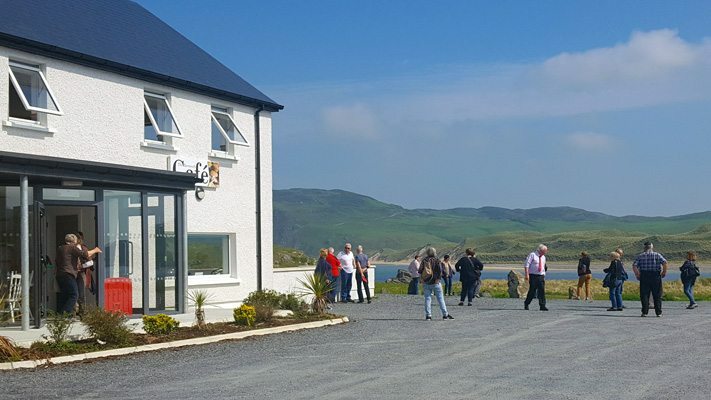 Visitors begin to arrive for the first tour of the day outside the new visitors centre & cafe, taking in the stunning views on offer around Doagh Famine Village across to the Five Fingers Strand at Malin. 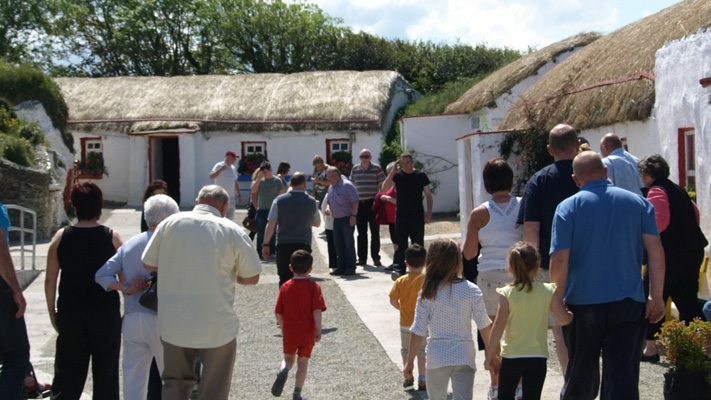 And so the tours begins as you enter Doagh Famine Village after leaving the new visitors center across the lane fully refreshed and ready to go. 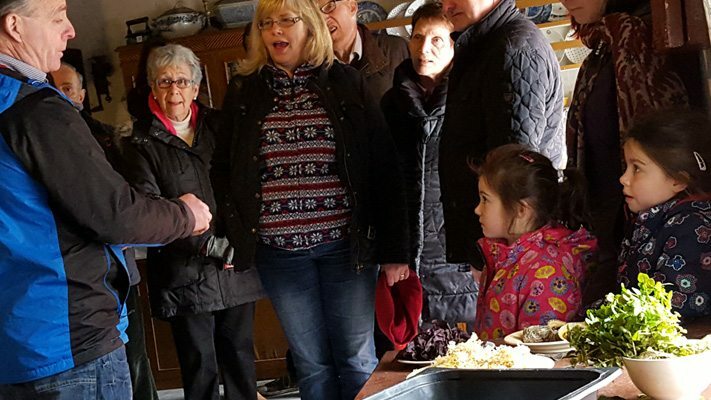 Throughout the tour there are various practical and interactive demonstrations to show how people survived in years gone by before modern appliances were introduced. Bringing the tour to life. 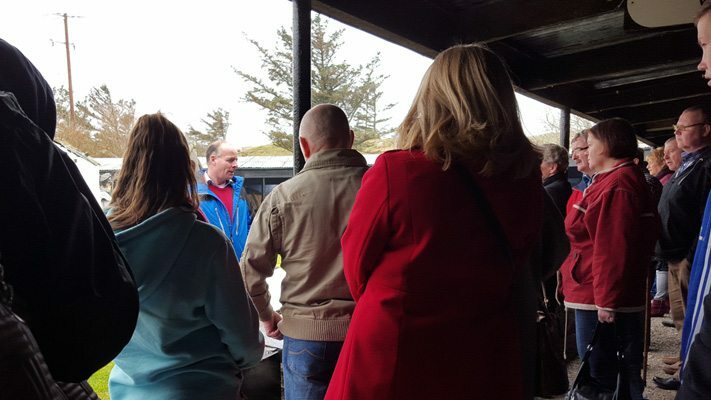 Your tour guide will explain the background to all the exhibits and attractions and take questions as you go about any part of the journey through Irish history. 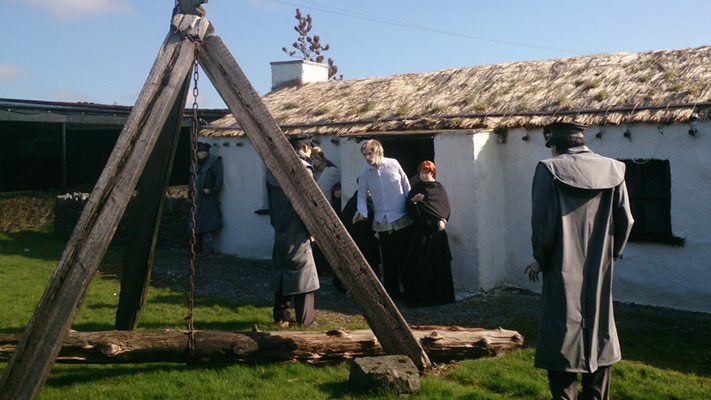 Throughout Doagh Famine Village there is a large selection of life size attractions and exhibits to depict all walks of Irish life through the last few centuries until the present day. You are more than welcome to spend as long as you like with us, just relaxing and enjoying a well earned rest in the sun or take in some of the attractions again yourself after the tour. 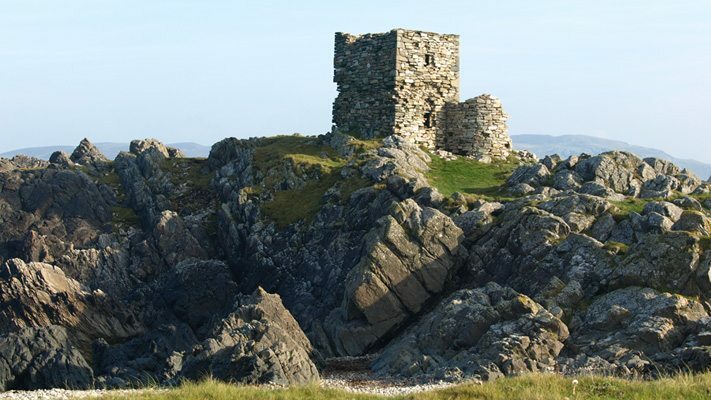 Doagh Famine Village is surrounded by so much natural history, even within a few hundred meters there are sights to see from Carrickabraghy Castle to ancient Rock Art. Religion has played a major part in Irish history. In the late eighteenth century many people from the Established Church felt under threat from Irish rebels and so they set up an organisation to help protect themselves. They named their organisation the Orange Order after their hero William of Orange. 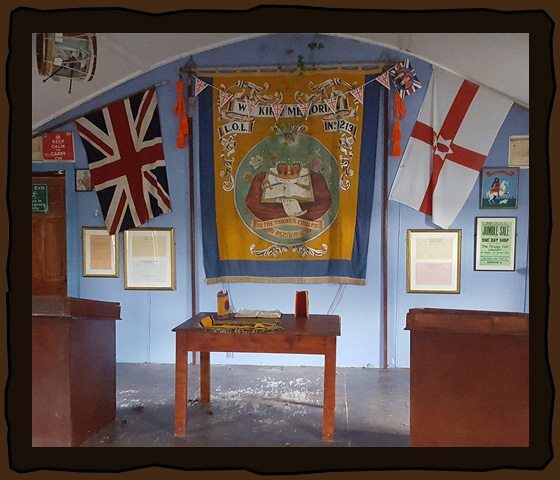 An Orange Hall was built to give some insight into this tradition. Many of the display items have been donated by the people of Whiterock, Belfast. This is one of the newest additions to Doagh Famine Village and the idea for it came from long term republican prisoner Eddie Gallagher. A safe house was a place of refuge by those running from the authorities. It was a place with secret passage ways where the escapee could hide. 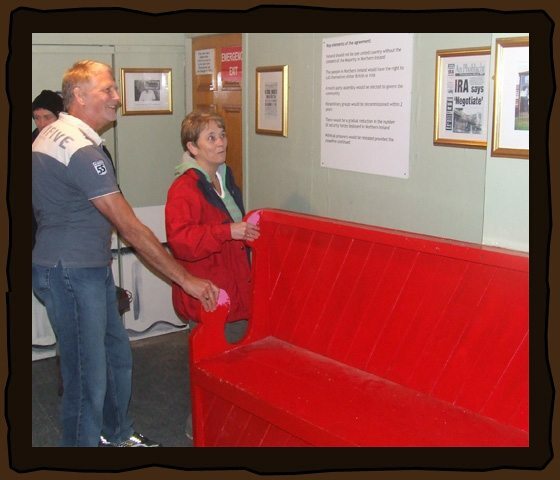 Each room in the safe house tells part of the story of the road to peace in Northern Ireland.